You had a dream last night. 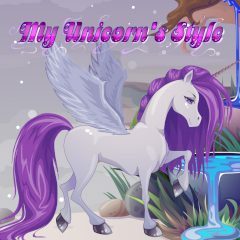 There was a beautiful unicorn and you could change his mane and tail style, choose wings for him and even horse shoes! Now it's more than just a dream! Decorate your unicorn in Dress up mode. Take a dare and decorate your unicorn in the same way as you see it in the original picture in Compare mode!